Combine all of the ingredients in a large mixing bowl and stir to coat the cherries with the mixture. 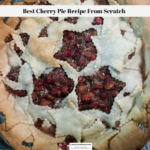 Place a pie crust into the pie pan and pour the cherries on top of it. Lay the second pie crust out and use a star shaped cookie cutter to cut out the designs. Lay the large piece of the pie crust on top of the cherries. Slightly dampen the cut out pastry stars and place them around the edges of the pie crust as desired. Put the pie on top of a cookie sheet lined in aluminium foil and then use strips of aluminium foil to cover the edges of the pie crust. Place the pie in the oven and bake at 425 degrees Fahrenheit for 25 minutes. Lower the temperature of the oven to 350 degrees Fahrenheit and bake for an additional 25 minutes, removing the aluminium foil during the last five minutes to brown the pie crust. Allow the pie to cool for at least 10 minutes, cut and serve.